It was stunning breaking news that happened just before dawn on January 18, 1978. 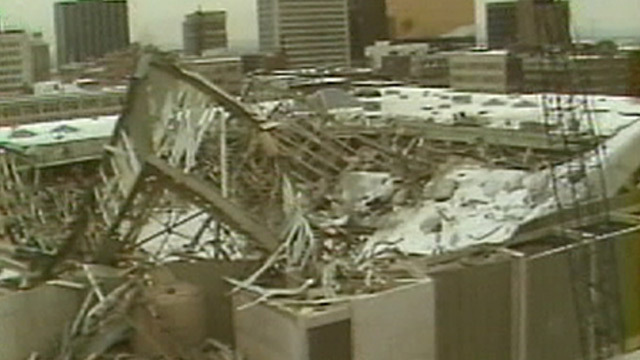 The roof of the coliseum at the Hartford Civic Center had collapsed under the weight of the snow. Just hours earlier, some 5000 fans had left after watching a basketball game. Remarkably, no one was hurt. 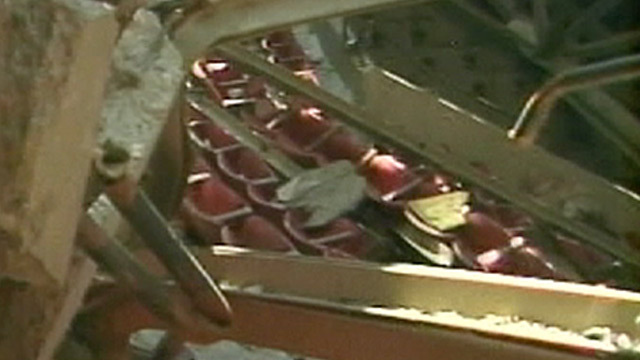 In 2013, in anticipation of the 35th anniversary of the catastrophe, we broadcast some rare footage of the aftermath of the collapse in a Face the State flashback. In fact, some of the images had never been seen. I discovered a copy of raw, unedited film from the day of the collapse that has been sitting in the Channel 3 archives for decades. 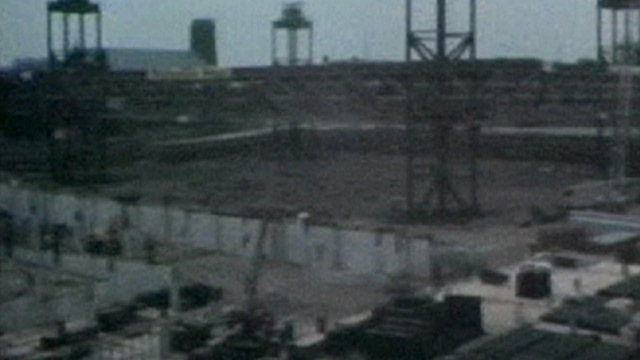 The report below also shows some even older film of the Civic Center being built in 1971. We have some time-lapsed film of the construction, including the critically acclaimed, yet flawed roof design that would later prove to be a calamity. 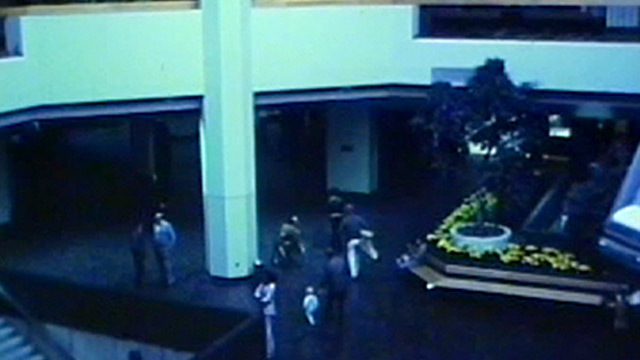 In addition, look for excerpts from a special report that first aired when the landmark opened in 1973. You’ll hear from William Luettgen, who owned a department store in the Civic Center Mall, and you’ll be able to reminisce over the images of the dozens of stores inside and lining the streets near the complex. Also in this Face the State flashback, vintage video/film of Barbara Kennelly, the Hartford city councilwoman who later became congressman, along with then deputy mayor Nick Carbone. There is also some of the oldest footage in existence of the Hartford Whalers. 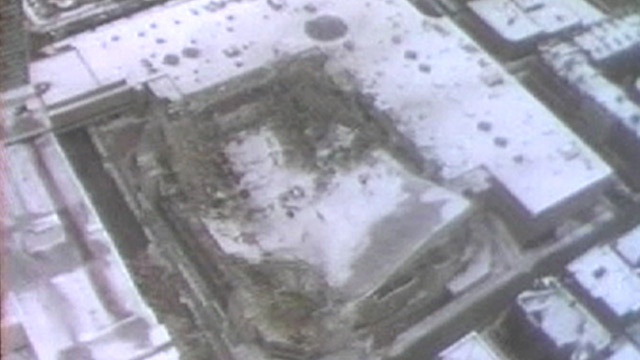 On the night of this collapse, there was also a collapse of the roof of Wyre Wynd in Jewett City. A third shift worker was killed. On this night, the Coast Guard lost two Connecticut men off Atlantic City while towing their disabled research vessel to the Inland Waterway. Tragic tragic incident during this storm. Steve Tsolis of Lyme and Phil Plumb of Essex were taking the company boat to a show in New Orleans, but were in the hands of the Coast Guard when they were swept overboard by a rogue wave. Not a word was broadcast by WFSB. This is a vivd memory for me, even though I was only 11 years old. I remember waking up to have my mother tell me that I would not, in fact, be seeing my very first concert (Shaun Cassidy) at the Civic Center. I was heartbroken! Looking at it from an adult/parent’s perspective now, I am so thankful no one was hurt. amazing the 2 men lost from CT were not mentioned ; pray for them now. Mandy; my sister first concert I took her to see Shaun Cassidy there and I who didn’t “claim” to be a fan just nonchalantly walked back stage and when Shaun asked for a cup of water; on stage; I handed him one. My sister up in the seats was so mad I didn’t save her the cup. oh the memories ole Harford Whalers; keep it that way; memories. Remember it well, I was a CCSC stuedent, (CCSU)~in those days it was a college not a university. I saw Harry Chapin about 6 mos or so b4 the collapse and remember thinking, as I sat in the Metal nosebleed bleachers, this place feels like its “swaying” Guess it was not as sturdy as they thought!!!! I remember looking out of my Daddy’s work window at the destruction and couldn’t believe it. It was devistating but for a 10 year old, pretty fascinating. Aw, this was a very nice post. Taking the time and actual effort to produce a very good article… but what can I say… I procrastinate a lot and don’t manage to get nearly anything done.